I am so busy in my gardens it’s been really difficult to sit down and write for The Perfect Garden Hose blog page. I’ve planned some relatively large projects coming this month including adding a garden, and removing one as well. Since I’m going to be getting even busier, I’ve already created an August to-do list to keep up with my day-to-day chores. I figured since it’d be a quick and easy post I’d share below. Start thinking about ordering bulbs. Take notes, and draw out gardens for future plans. It’s been pretty wet around here, but if rain is lacking in your area be sure to water and water deep. Be sure to keep up with the weeds, August offers the perfect climate for weeds to overtake a garden. Mow regularly to a height of roughly 2-1/2”. The end of the month is a great time to fertilize your lawn. Late August is a perfect time for planting grass. Fight pests, I’ve noticed some aphids here and there so I’ve begun to deal with them accordingly. Other pest are sure to show up eventually. It’s a good time to put up a hummingbird feeder if you haven’t already. As summer blooms fade the hummingbirds will already know where they can come to find nectar. Prune summer flowering shrubs after they’re done blooming. One shrub I do wait on are my Rose of Sharron, I prune these in early spring. Prune out any dead “wood” from shrubs and trees. 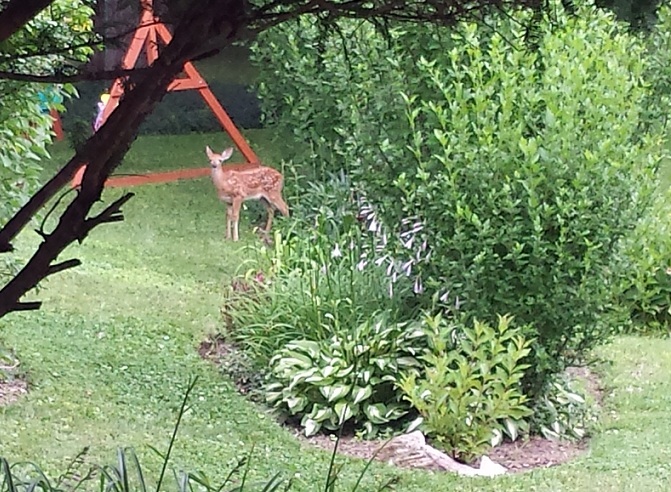 Keep applying deer repellent, they’re around less but they’re still around. You can start to plant late season annuals to get a jump on color, but I usually wait until early September for this. Clean up and organize your, potting sheds, garden sheds, garages, etc…if you’re like me these get pretty messy during the busy summer months, and it’s good to be nice and organized for the fall. That’s roughly it right there, and it’s about all I can handle. Let me know if there’s anything you would add to my list, it’s not like I’m busy or anything. This entry was posted in Homeowner, Landscaping, Uncategorized and tagged August, Bird feeder, Garden, Garden hose, Plant, Prune, September, Shrub, TUFF GUARD The Perfect Garden Hose, Twitter. Bookmark the permalink.